Organic. Not a typical word that you will generally hear coming from my mouth. When I think of eating organic, I conjure up thoughts about middle aged hippies with long flowing blond hair. I apologize for the stereotyping, but I’m just trying to be honest here. So when I was told by my Bible professor to eat a completely organic meal for an assignment, I freaked. I had never cooked with organic products and had been pleasantly fine eating my organic carrots. Despite my apparent dismay, I went with it. I frantically searched the Internet looking for organic recipes that I could create for my family that wouldn’t taste like earth or meal worms. But then, it dawned on me. Organics aren’t reconstituted animals or meatless veggie buffalo wings. 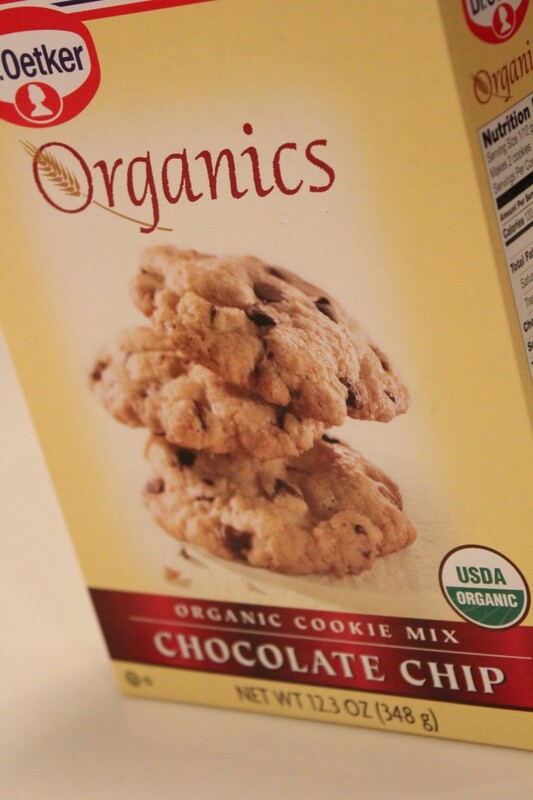 Organics are real food, fresh, wholesome, and hormone-free. 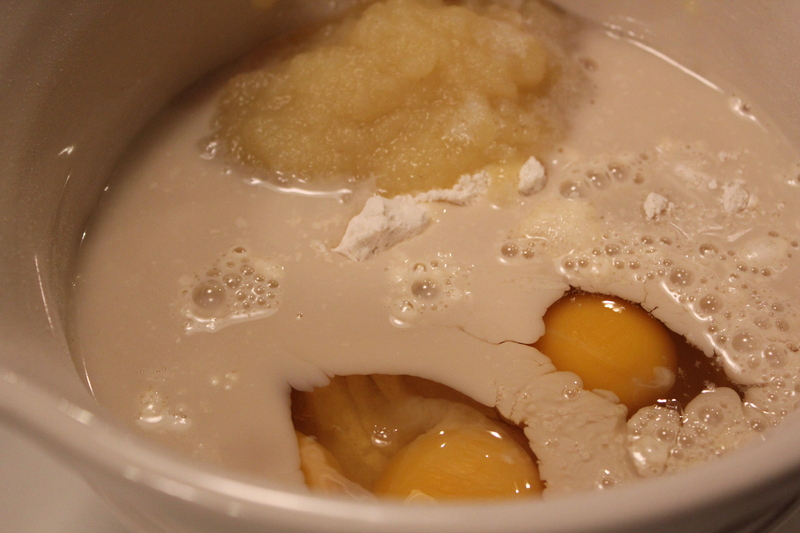 I could make ANYTHING, I just need to make it all with organic products, which wasn’t easy…or cheap. I scooped up Jared and told him that we were going on an exciting trip to see the wizard. Because of his curiosity (and because the fact that he is whipped), he got in the car and we headed to the only grocery store in our area that has a whole aisle donated to organic and gluten free products, Giant. After scanning the aisle 72.3 times, we had decided on what to purchase. 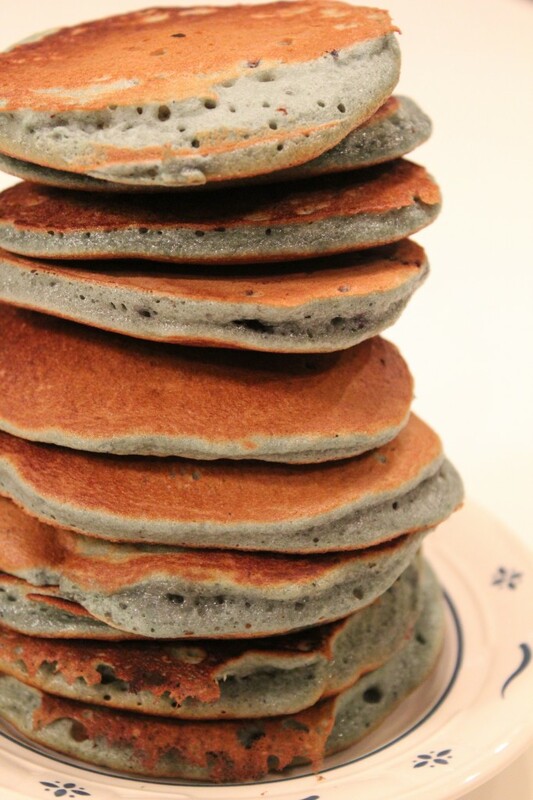 We would make pancakes! Easy, right? No. 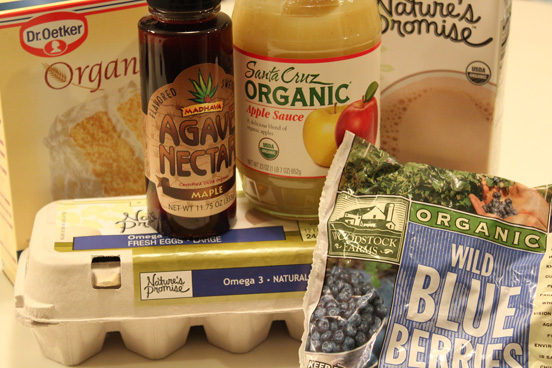 Not only did the pancake mix require natural eggs, but it also required organic syrup, organic butter, and organic oil! $10.99 for a bottle of organic oil? I think not. Finally, after visions of organic animal crackers, hormone free pepperoni pizza, and meatless organic tofu, I conjured up an excellent idea. Cake pies! Ahh-ha!…let the adventure begin! 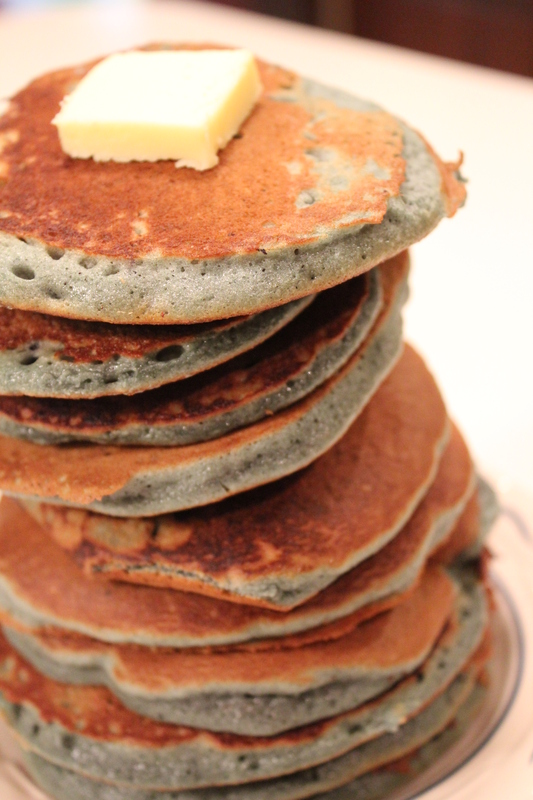 Why not make pancakes with cake mix? So, we did…and gathered up our lovely findings for this surprisingly healthy meal. Applesauce. 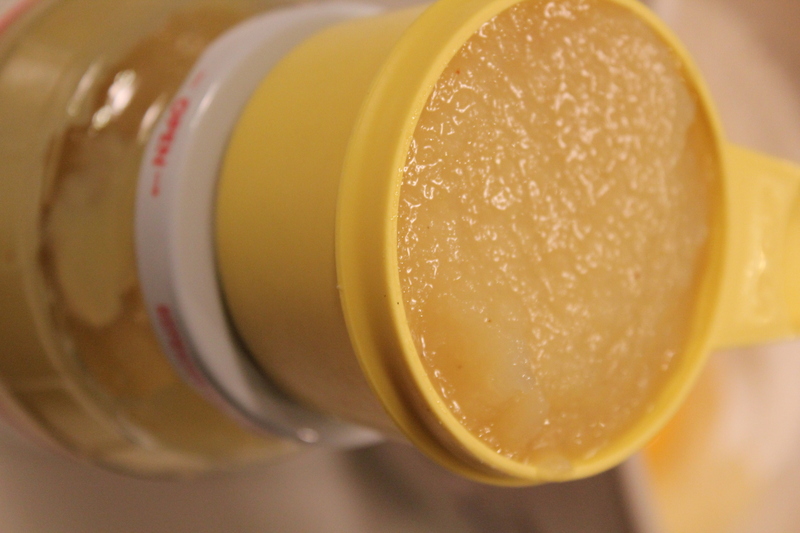 Because I wasn’t going to spend $700 for oil, I thought that organic applesauce would most definitely do the trick. 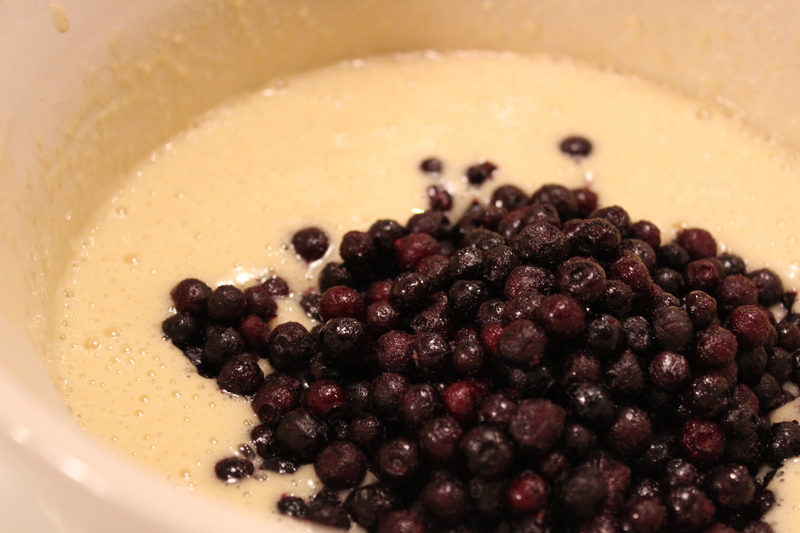 Mix up your cake batter and pour in the frozen blueberries. 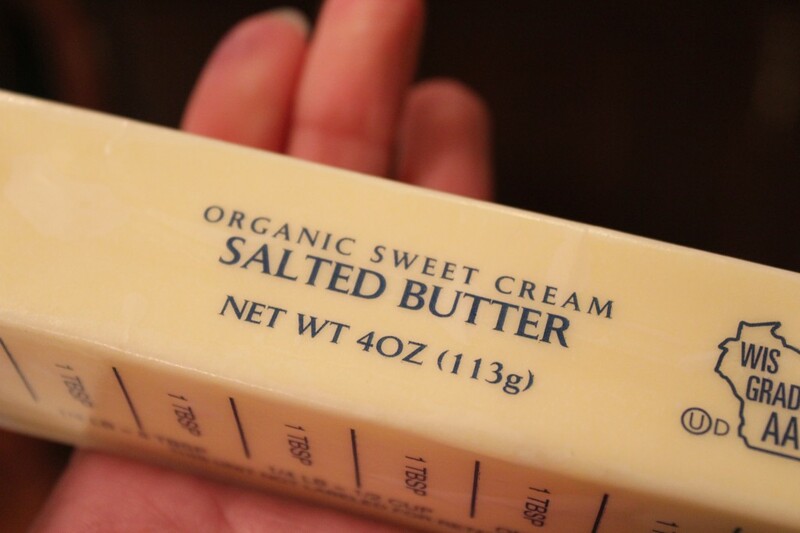 …..and yes Professor Bohmbach, I did spend $5.99 on organic butter. I should have just written organic on my $2.00 butter. And although the temptation was great, I remembered that the name of the class is Applied Biblical Ethics. So, I bought the stinking organic butter. And guess what? They were absolutely outstanding. I was planning on just tasting one and eating something else. Well, lets just say eating something else wasn’t a thought that crossed my mind when I finally finished, 153 little bites later. 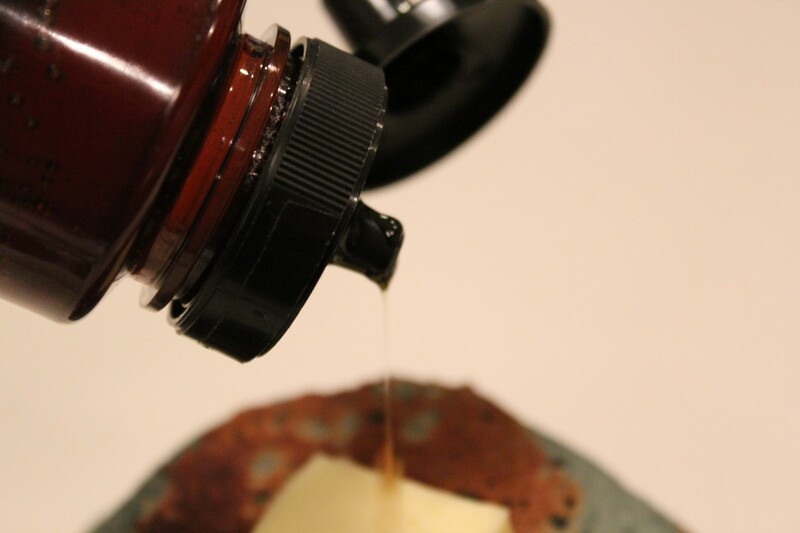 But wait, organic pancakes, organic butter…yeah..yeah, what about the syrup? Well, what ABOUT that syrup. 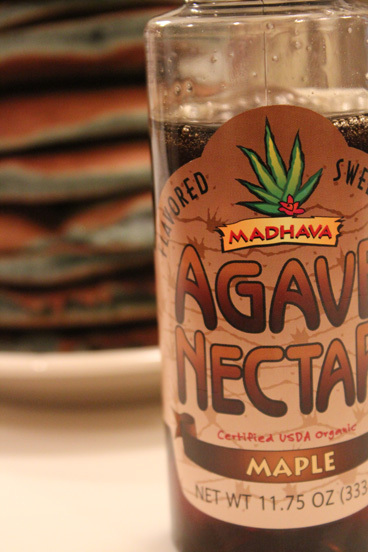 Madhava agave nectar is divine. The thin, sweet, syrup was an excellent addition to those fluffy cake pies. 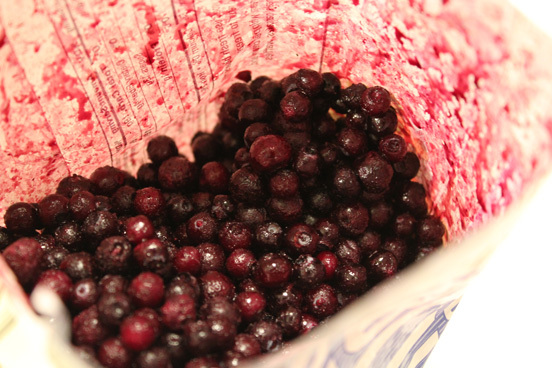 Stir in frozen blueberries, they will warm up while you are cooking them. Heat skillet on medium heat. Add organic butter to skillet to prevent sticking. 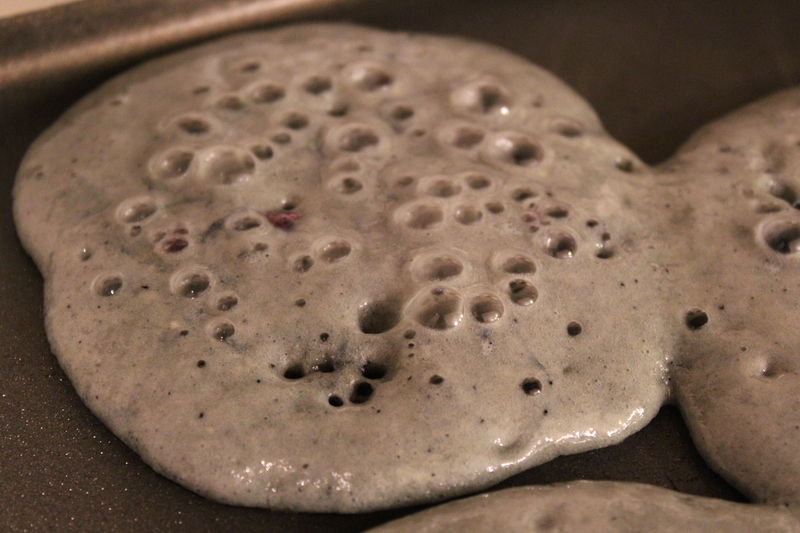 Pour pancake batter onto skillet in 1/4 cup increments. 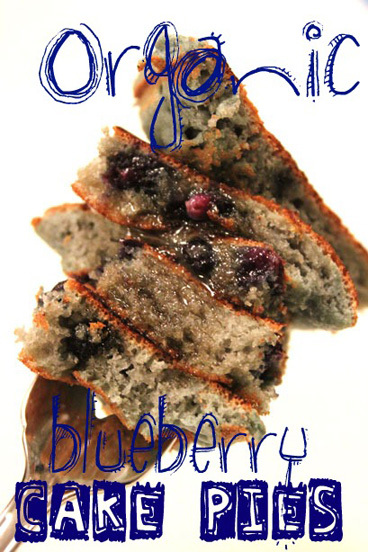 Serve warm with organic butter and agave nectar. 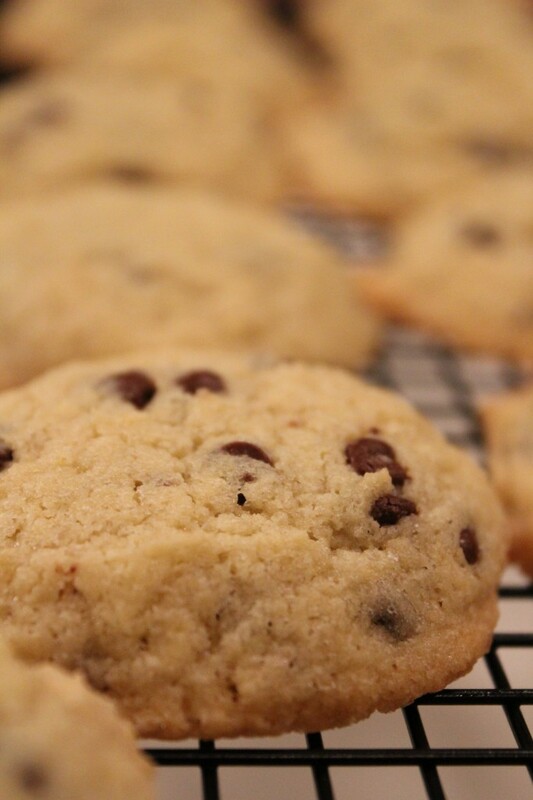 And to end the organic evening, Fresh COMPLETELY organic chocolate chip cookies. Through this little journey, I learned that eating organic isn’t some type of mutation that forms on your brain. It’s not a herbal disease that encompasses your body, and lastly, it’s not even a mental disorder. Eating organic makes you feel like you had a wholesome meal. It instills pride that you didn’t eat from “the system.” That you went over and beyond, and did something good for your body. Plus, it’s absolutely delicious. Bravo. Try and cook something organic for your family! Your body and tastebuds will thank you.